Many years ago I heard a story from a member of a committee of a midwestern university that was thinking about hiring a certain economist. The economist had an alternative offer from a southern California university that paid a couple of thousand dollars more in annual salary. The economist offered to come to the midwestern university if it would match this slightly higher salary . But the hiring committee declined to match . As the story was told to me, the hiring committee talked it over and felt: "Spending a couple of thousand dollars more isn't actually the issue. The key fact cost of living is vastly higher in southern California. An economist who isn't able to recognize that fact--and thus who doesn't recognize that the lower salary actually buys a higher standard of living here in the midwest--isn't someone we want for our department." The point is a general one. Getting a higher salary in California or New York, and then needing to pay more for housing and perhaps other costs of living as well, can easily eat up that higher salary. In fact, the Bureau of Economic Analysis now calculates Regional Price Parities, which adjust for higher or lower levels of housing, goods, and services across areas. Comparisons are available at the state level, the metropolitan-area level, and for non-metro areas within states. 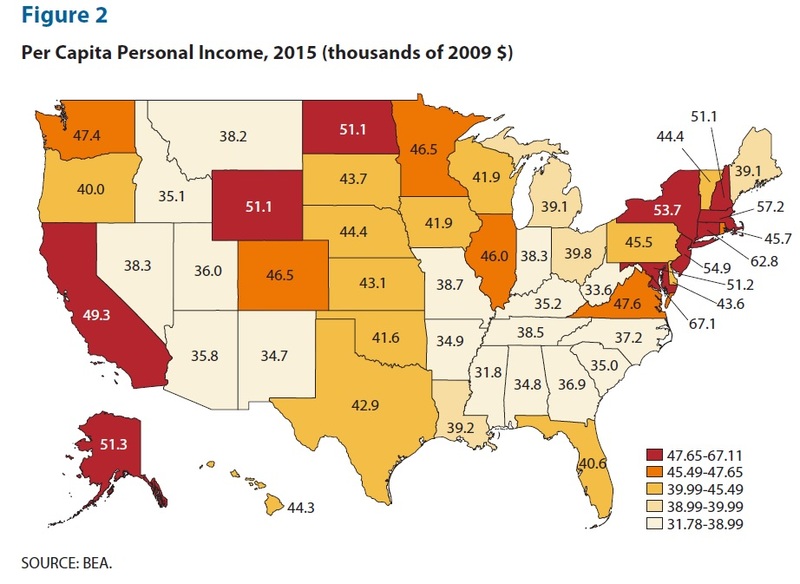 To illustrate, here are a couple of maps taken from "Living Standards in St. Louis and theEighth Federal Reserve District: Let’s Get Real," an article by Cletus C. Coughlin, Charles S. Gascon, and Kevin L. Kliesen in the Review of the Federal Reserve Bank of St. Louis (Fourth Quarter 2017, pp. 377-94). Here are the US states color-coded according to per capita GDP. For example, you can see that California and New York are in the highest category. My suspicion is that states like Wyoming, Alaska, and North Dakota are in the top category because of their energy production. 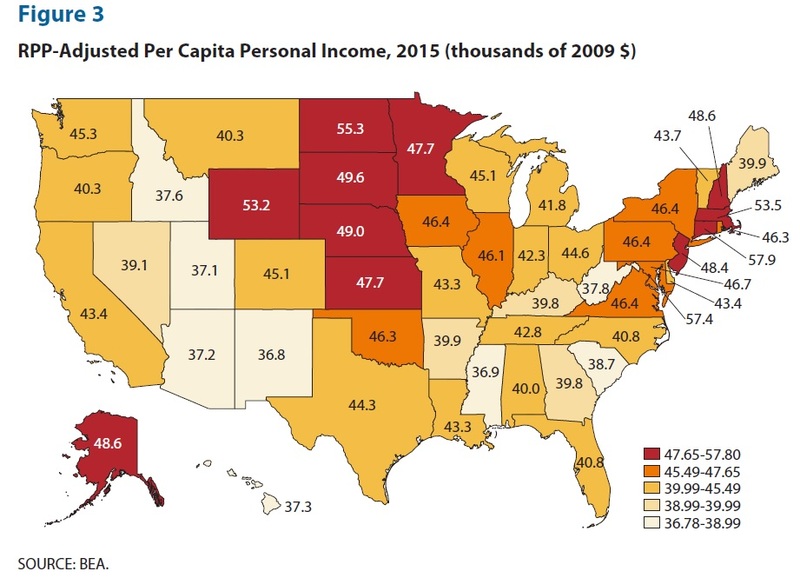 And now here are the US states color-coded according to per capita GDP with an adjustment for Regional Price Parities: that is, it's a measure of income adjusted for what it actually costs to buy housing and other goods. With that change, California, New York, and Maryland are no longer in the top category. Hoever, a number of midwestern states like Kansas, Nebraska, South Dakota, and my own Minnesota move into the top category. A number of states in the mountain west and south that were in the lowest-income category when just looking at per capita GDP move up a category or two when the Regional Price Parities are taken into account. 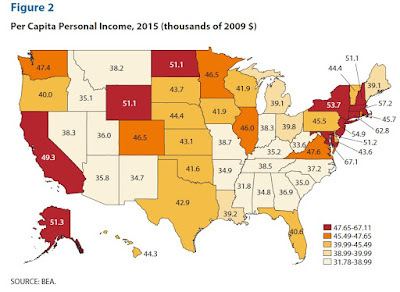 When thinking about political and economic differences across states, these differences in income levels, housing prices, and other costs-of-living are something to take into account.